Since I am now selling Tarot readings, I thought I’d give you guys a peek into some stuff I do for myself. I will say that a lot of the time I was depressed (so much of the last 10 years), I did not have a consistent spiritual practice, and that includes not using cards for a long time. But lately, I have been more consistent. I’m reopening myself to the spiritual, being in tune with myself again. One of the things I like to do is draw cards for myself from time to time. I’d like to say that I do it daily, but that would be a bit disingenuous. I have the intention of doing it daily, but too often I allow other things to get in the way. I’m working on practicing more with newer, non-Tarot Oracle decks. There are some really wonderful ones out there. Oracle cards are more modern than Tarot. They may or may not use traditional imagery. I’m really drawn to ones that are pretty new. They usually have between 40-60 cards, as opposed to 78 in a Tarot deck. They are not organized the same way as Tarot. Currently, I’m spending a lot of time with Wisdom of the Hidden Realms by Colette Baron-Reid. I would like to post a weekly reading, so you can see a bit of what I do. I am still learning this deck, so I do use the book a bit, but I then meditate on what the book says and interpret it by what it means to/for me (or a client). If I used Baron-Reid’s words, I will use quotes. In this book, for most of the cards, if the card is upright, the spiritual character listed is an Ally. If reversed, s/he is a challenger. Some of you that have already gotten a 3 card reading may realize that this is slightly different from how I do a 3-card with Tarot. Different cards, different way to read. 🙂 But there are always different ways to interpret. The thing is to be clear on what you are doing before you draw the cards. 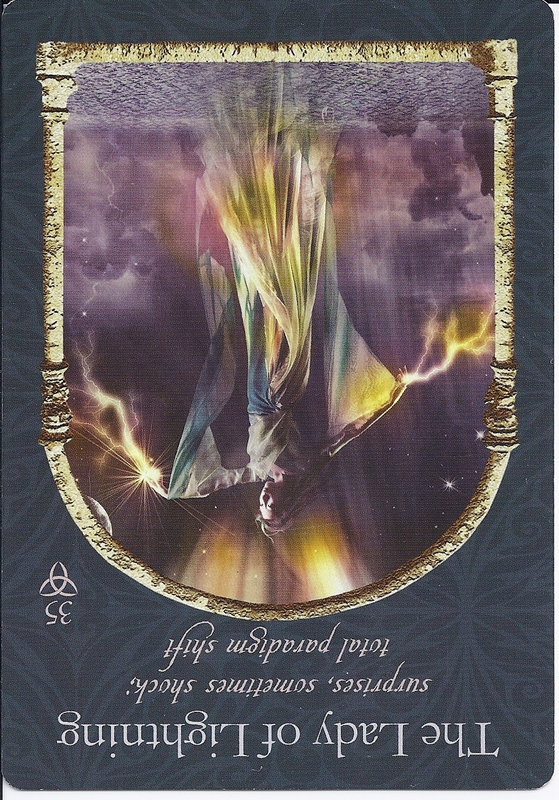 The first card here, representing a present influence, is The Lady of Lightening, as a Challenger. She warns of unexpected bad news, but also gives hope in the form of a message to wait out the storm. I think I know what that is about. I don’t feel like sharing that here and now, though. The Diamond Dreamer as an Ally. 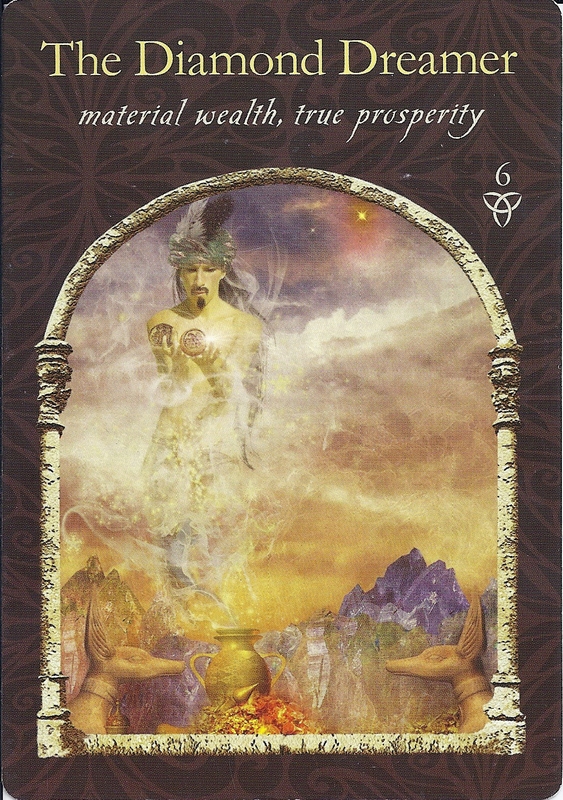 His keywords, seen on the card, are material wealth, and true prosperity. Considering my most recent post, I like that! On Friday night, I found a listing on a temp agency’s website for a “Math Content Editor” that seems to fit a lot of my skill-set. The pay is FABULOUS. But he reminds me that I have to do some work, too. Today, I need to tweak my resume to fit the requirements and get it actually sent! (This is one of my biggest stumbling blocks). They can’t know I’m perfect for the job if I don’t tell them. 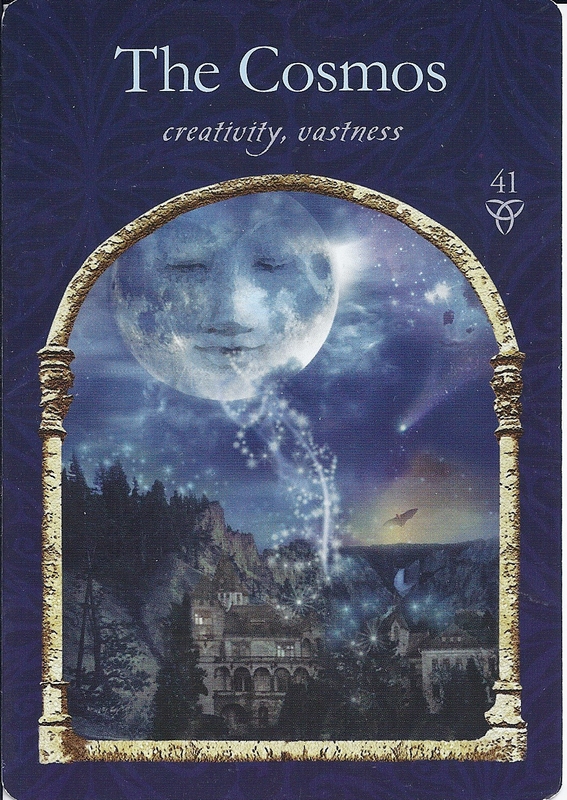 The Cosmos – The keywords here are creativity and vastness. This card is ALWAYS an Ally, even when reversed. It’s all well and good to break down each card like that, but what does it mean that they were drawn together, in this order, on this day? This is where the intuition part comes in. What I’m getting is that even though I may feel like I’m in a bad place right now (Lady of Lightening), if I keep making an effort towards things I want (both Diamond Dreamer and Cosmos), and I am clear in my intention (Diamond Dreamer), and I allow my creativity to come through (Cosmos), things will start to pull together for me – I will get what I want (both Diamond Dreamer and Cosmos).